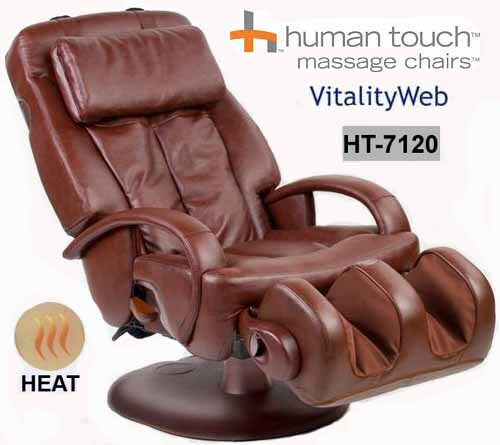 HT-7120 ThermoStretch Stretching Human Touch Home Massage Chair / Recliner + Heat - New Massage Comfort Number system lets you control the intensity of the massage from gentle to intense without interrupting your massage session. Massage comfort number functions in all modes and can adjust back comfort even when the massage is off. 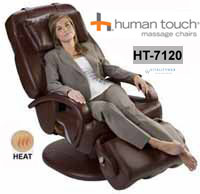 The HT-7120 also features dual lumbar heaters to gently warm lower back muscles, gradually reducing tightness and pain. Includes a rotating calf and foot massager with a new width control feature for a customized fit. Two 15-minute programs offer gentle or vigorous calf and foot massage. Rollers and massaging discs surround your feet and calves, giving a squeeze and release massage that feels like several pairs or hands. Beneath this luxurious leather are the “hands” of a trained massage professional – ready to provide you with a customized back, leg, and foot massage at the touch of a button. You have to feel it to believe it. Our multi-patent Human Touch Technology® massage system so closely replicates the therapeutic techniques used by back and spinal care professional that it is the preferred technology of the American College of Chiropractic Orthopedists. It is designed to follow the natural contour of your spine and move three-dimensionally in four different modes. HT-7120 does what you tell it, from the ergonomic headrest to the rotating calf and foot massager with adjustable width control. You customize each movement to your own preference. The remote controller gives you direct access to two individual preprogrammed massage sessions lasting 15 minutes each. Discover the ultimate in Robotic Massage® wrapped up in a stylish, superior quality exterior that is virtually maintenance free. 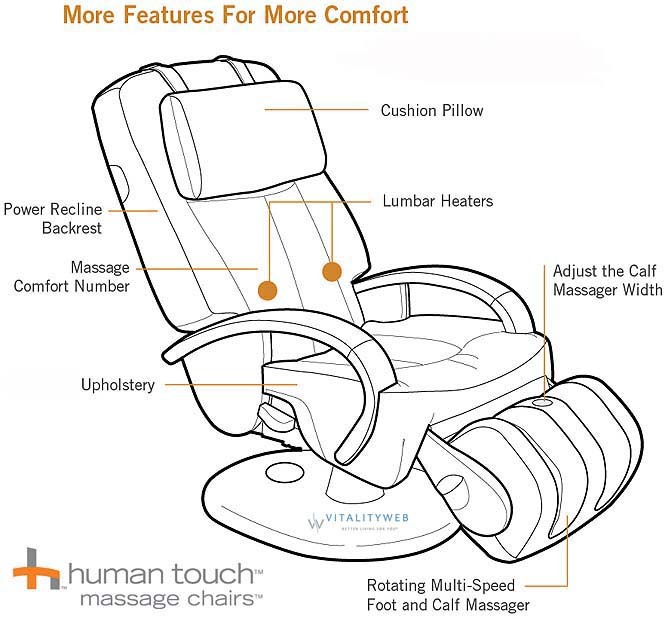 New Massage Comfort Number technology allows you to customize the intensity of your massage from gentle to intense. ThermoStretch™ combines Dual-Lumbar Heat + Full-body Stretching to help alleviate stress, tension, pain & sore muscles. Adjustable Width Calf and Foot Massager allows you control the massage intensity. Heat control for the backrest -Dual lumbar heaters to gently warm lower back muscles to help reduce tightness and pain. Seat Width (between arms) is approximately 19.25"
Extended 2 and 5 year Human Touch Factory Warranties are available on New HT-7120 Chairs. *WARRANTY INFORMATION: New HT-7120 Signature massage chairs have a "3/2/1" Year Factory Limited Warranty. The New HT-7120 massage chairs come with a manufacturer's three-year limited warranty against Structural defects (Frame only - cosmetics are not covered). Parts are covered for one year from the original date of purchase. In Home Factory Service (All 50 US states and most major cities in Canada) is covered for one year from the date of purchase and can be extended with an extended warranty. Refurbished Massage Chairs have a 90 Day limited residential use warranty for parts only. The warranty is not valid if the product has been misused or damaged in any way that is beyond the control of the manufacturer. Chairs are packed for shipping and require only very minor assembly. (Basically just unpack and ready to use.) 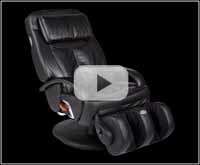 Extended warranties are available on HT-7120 Massage Chairs.